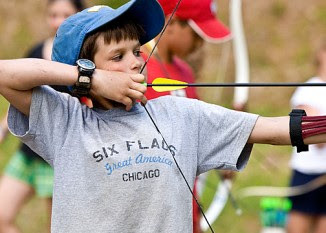 Camper at a Jewish camp tries his hand at archery. NEW YORK (JTA) -- As social service agencies and charities brace for the fallout from the country's economic downturn, Jewish overnight camps already have felt the crunch: They are reporting a dramatic increase in requests for financial aid this summer. More than 70,000 Jewish children attend some 150 nonprofit Jewish overnight camps. That number reflects an increase in recent years as the Foundation for Jewish Camp, working with other local agencies and private foundations, has engaged in a multimillion-dollar program to provide incentives to first-time campers. The focus on camping comes as recent studies have shown that Jewish summer camps are the most effective form of informal Jewish education and identity building. But many American Jews who once could afford camps, which can cost upwards of $7,000 for a season, are finding themselves priced out because of the squeeze on family budgets due to the economic downturn. This year they increasingly asked for help, according to camping officials. Silverman said the increased request has been heard across the country. To make up for the scholarship crunch, he said, many camps have been forced to cut other budget items, such as off-campus trips, food and maintenance staff, busing and capital improvements. Camp directors and agencies that provide financial aid for camps almost uniformly confirmed Silverman's observation. Camp Ramah New England had to increase its budget line for financial aid from $180,000 last year to more than $200,000 this summer, according to its executive director, Rabbi Ed Gelb. The Combined Jewish Philanthropies in Boston tripled the number of scholarships it doled out for camp this year, according to its director of informal education, Ed Pletman. In New York, the UJA-Federation of New York increased its budget for scholarships for overnight camps from $400,000 to $550,000 to help ease the situation, Louise Greilsheimer, the federation’s senior vice president for agency and external affairs, told JTA. In Philadelphia, the Jewish Federation of Greater Philadelphia saw a 15 percent increase in requests for financial aid, according to its manager of allocations, Brian Mono. And on the West Coast, the country's largest financial aid program for Jewish residential camps, which is run out of the Bureau of Jewish Education of San Francisco, the Peninsula, Marin and Sonoma, received 180 more applications this year than it did last year, according to its financial aid director, Janet Rothman. "On average, a three-week camping experience in California is about $3,200, and if there are multiple siblings, for some people there is just no way you can afford that," Rothman said. "Absolutely the economic downturn is driving people to us." Many of the new requests are coming from higher-income applicants. The federation in Philadelphia, for instance, received 81 applications from families with net household incomes above $100,000, according to Mono. Twenty of them received aid, primarily because they also were paying for day school tuition. The Foundation for Jewish Camp is trying to double the number of Jewish children enrolled in Jewish overnight camps and has been working with private foundations to give out non-need-based incentives of up to several thousand dollars to first-time campers through its Campership program. Camping officials said it isn't clear now if the scholarships helped ease some of the financial pain or if the influx of campers has also brought an influx of campers with financial needs. But it is clear that in some parts of the country, the program itself has been crimped by the economy. The New York federation, for instance, saw a slowdown in the growth of its incentive program as fewer parents than expected applied for the scholarships, said Greilsheimer. Despite the discount from the scholarships, parents simply could not afford to pay the rest of the price of tuition, she said. The situation stands to get worse, according to Miriam Chilton, the director of business operations for camping and Israel programs for the Union for Reform Judaism. The URJ operates 12 overnight camps for some 9,000 campers and allocates about $1 million annually for three financial aid programs, Chilton said. But for next year, the URJ already is looking at increasing the financial aid number to $1.5 million. Camp officials told JTA they already are starting to raise more money for next year. The Foundation for Jewish Camp has never been in the business of giving need-based scholarships. But for the first time, Silverman said, the foundation is considering rolling out a financial aid component. In New York, it is running a pilot program with two camps to help the neediest attend camp, as well as to help them with supplementary money to pay for clothes and other camp expenses. Increasing dollars will be a daunting task, Chilton said, given that fund raising becomes even more difficult in a tightened economy. She said she already has seen "donors who are taking much, much longer to commit." "It's a catch-22 situation because often times when need is greatest, funding is the lowest, and that is goign to be the conundrum going forward," Chilton said. And, she added, "The question is how long can we sustain this. If it is one season, we will be OK. But the question is will it be multiple years."